Happy New year everyone! Are you ready for a creative way to start the new year? With the holidays behind us (phew!) and the new year looking straight at us, I thought I’d host a Birds of Change Exchange. I’ve been dreaming up this idea for months now and wanted to wait till the seasonal chaos had come to a close. The idea came from wanting to hang handmade birds throughout my home, windows, wall, plants etc. I just didn’t want to them all to be made by me. I also have been thinking a lot about the new year and the many new, exciting and unknown changes to come. I want to approach the new year as positively as possible. I thought that maybe these birds might help serve as reminders throughout the year to be hopeful, positive and open. 1. Handmade birds only. Made to hang, all year long. They can be sewn, embroidered, felted, painted, stamped, decoupaged, beaded, recycled, stuffed, knitted, crocheted, or made from paper, etc. Anything goes, but it MUST be something you would be thrilled to receive. 2. Think small, ornament style. No bigger than your hand (roughly 4 x6 in). Remember these will be going through the mail. You will pay for postage, so that will guide you on how heavy you would like your birds to be. 3. Make five. They can all be the same or they can all be totally different. Consider making a 6th to giveaway on your blog on January 20th, for a birds of change giveaway. I will list all participants for the giveaway on my blog so folks will know where to go. 4. All birds must get to me by Saturday, January 17th. 31st. You will send your birds with return postage (international folk will pay for postage via paypal). I will be sending all participants detailed instructions once sign-up is closed. 5. You do not have to have a blog to participate, but it would be nice to see what everyone makes. A flickr group has been started so that you can share what you have made with EVERYONE! Please add yourself as a member if you are joining. 5. I will send out 5 new birds, to each participant, by January 26th February 9th. 6. Sign up is closed– thanks 🙂 Sign up closes Friday, January 9th. Email me at regina(AT)creativekismet(DOT)com to join in. ***In the email, please include your name, your web address, home address and flickr address- whatever you have. Please help spread the word by copying the swap button (see buttons here) and putting it on your own blog with a link to this post. Thanks so much for being a part of my creative world. I hope each and every one of you has a beautiful, healthy and happy new year!!! This entry was posted in i make stuff, Mail box and tagged bird, exchange, handmade, ornament, swap. Bookmark the permalink. You know I wouldn’t miss it. This looks like so much fun! I have never done a swap before, but one of my New Year’s resolutions is to do one thing that is out of my comfort zone. This is perfect! What a lovely idea! Thank you! Ha, I finally got into one of your projects in time! I would love to join up! I’ll shoot off an email when I’m done. Definitely count me in for the Bird Exchange – I’ve been excited about it since you mentioned it last year – it’ll be so much fun I’m sure. I must participate in this – where there’s a will there’s a way, right? Count me in! oh this is wonderful. I love birds and to have them to hang around the house would be great. But I just don’t think I could make that many by that date. but I will be watching the flicker group to see all the cute birds being passed around. Do these ornaments have to be handmade by me? I have a friend who makes beautiful hand made bird ornaments, but would never do this kind of thing. She sells them in local art galleries. I also make felted birds, but it would take me long past January 19th to make five of them. Oh this looks like great fun! I have too much on to take part though. Maybe you’ll do another later in the year? saw this over at calico daisy and now that you’ve extended the deadline to have them mailed, count me in! will email you in a bit with my ‘particulars’…thanks for hosting a neat swap. ps: this will be my first ever swap/i’m very excited! I actually just designed (a very simple) bird ornament to be a gift topper for Christmas gifts! I will see about spiffy-ing it up a bit for the exchange! Very fun idea! I’m in! I would like to join. I sent a mail. Thanks for the invitation… I just sent an e-mail to you and want to participate in this one!!! Sign me up too. Sounds like lots of fun. The email will be off to you shortly. Hello, your bird exchange is such a wonderful idea! I didn’t hear about it until today…too late to join, I think 🙁 Please keep me in mind if anyone drops out or you hold another swap! Thx so much! Great idea, i love it! Sign me up, please! I too just stumbled across your site (funny how that happens!) 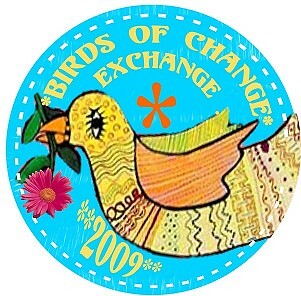 and missed the opportunity to be part of the birds of change swap. What do you do to let your followers know of swaps or challenges? If you have an e-mail alert list, please add me to it. I am particularly interested in swapping hand carved stamps. I am a bird lover and I married one or at least someone with birdie surname! What a fantastic idea! Oh, I just found this! I am so sad I missed out! Please do it again? …so I can join in on the fun! Can you stick me on a mailing list?